Gentle readers, it seems some folks in town are starting to mount another attack on Ann Arbor's crosswalk ordinance. They say it is too confusing to expect drivers to follow different traffic codes in different municipalities, that the ordinance gives pedestrians the false sense of security to cross without looking, and that it creates a situation where drivers yielding to pedestrians at crosswalks are likely to be rear-ended. It is unfortunate that decades of urban planning have left us with places where walkability was an afterthought. Who would have thought that the thousands of students living on North Campus would ever want to leave their bucolic 800 acre enclave to cross Plymouth Road to buy groceries, or go out to eat? Nevertheless, we have created an environment where driving is a right and pedestrians are an afterthought. I think the Ann Arbor's ordinance helps rectify the situation. That said, I don't think the city has done a great job communicating the specifics of the ordinance to all drivers in the city, especially those who may be commuting or visiting from other municipalities. To remedy this, I would suggest getting some custom traffic signs like the one above (only 10.57 each for orders of at least 100 at buildasign.com!). These signs could be placed both at major entrances to the city and a few hundred feet in front of problematic crosswalks. Gentle readers, what are your thoughts on the crosswalk ordinance? I'd welcome contrasting points of view on the subject. The crosswalks not at traffic lights on Plymouth are a public danger, both to the pedestrian and to the driver. Either put traffic lights at these crosswalks or eliminate the crosswalks and make pedestrians walk to a lighted intersection. I've been through a few Michigan cities that don't have a local law about crosswalks, but that do have marked crosswalks much like Ann Arbor with signs in about the same places. The only difference is that the signs say "state law" rather than "local law". Somehow (and this might be just me) the presence of a "state law" sign seems more authoritative than a "local law" sign, for the same setup. I'll bet that drivers just see a sign and don't parse the "local law" part of it until way too close to the intersection to make a decision. I've gone back and forth on this as a mostly pedestrian. I would agree that Ann Arbor hasn't done a great job on communicating what drivers should do. I have the almost daily experience of standing at the crosswalks on Liberty and just watching drivers stare at me waiting to cross (they definitely see me). I tend to give a pass at night because there isn't adequate lighting to see pedestrians. To my thinking, the current system is not working, so there have to be changes. I think the crossings with 2 lanes are particularly dangerous for pedestrians because one car or bus may stop and the other lane doesn't. I would like to be optimistic on this but I get even more discouraged when the AA police also do not stop for pedestrians. If they aren't going to follow the law, I'm pretty sure they are not going to enforce it. *The crosswalks that only have the "local law stop for peds" signs... I suspect a person with 20/20 vision traveling at 35mph would be well beyond a safe stopping distance by the time those signs, with their tiny type, can actually be read. * Beth's experience on Liberty is similar to mine on Packard. So few cars stop I've been tempted to start recording my crossings in hopes there'd be more enforcement... but again, like Beth, cops generally don't stop either. * I do agree with the haters that say the fact that we have six different kinds of crossing does NOT help a driver know what to do. * I also think enforcement (and consequences) should match the reality of the situation. Almost killing someone accidentally with a car should be the same as almost killing someone accidentally with a gun. The mindset of death by car being a negligible price our society pays is horrifying. Pair that with the fact that you have to kill someone to get us to check on whether you are too old, addicted, distracted, etc. to have a license any more (and if it's old we probably STILL won't take your license away) and you've got a country where people on foot aren't people at all. They're just soft obstacles. * I also ride a motorbike. I am completely terrified to stop at a crosswalk if there are cars behind me. MC'ers get hit all the time from behind at red stop lights (one of the reasons filtering is the safe thing to do)... and those are stop lights at expected locations. ps as far as the urban planning goes. Take a listen. It seems that crosswalks hardly exist under the state law. If there's no rule for stopping for someone waiting at a crosswalk, what is a crosswalk, exactly? All the state law says is "don't run over people", as far as I can see. But that's true whether there is a crosswalk there or not. I have the same problem when crossing Beakes at 4th (I think it's Beakes, either that or it's Kingsley). No one stops and I don't expect it. What makes it worse is that sometimes one lane will stop and the other won't which leads to mayhem. And I've almost gotten rear-ended stopping for people in crosswalks. So I worry about any pedestrian who honestly thinks these things are being enforced and just starts to wander into the street. I think it would take A LOT of education to get people to pay more attention when driving...I'm guilty of being distracted as well. 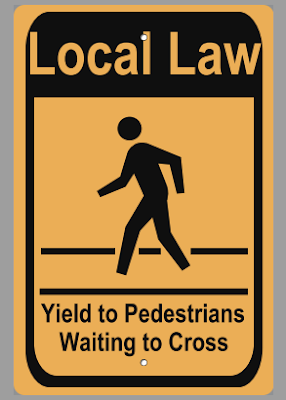 Ypsilanti, get ready for continued neglect of our crosswalk ordinance. No signs, no enforcement, no discussion. They are too dangerous on 4 lane roads. There is so much going on, and guests in our community are looking for where they should turn, rather than for the hawk lights. The pedestrian needs to take responsibility and make sure they can safely cross, because they will pay the ultimate price. It doesn't really matter who is right if the pedestrian gets hit. I find the crosswalks by bus stops are the most confusing for drivers Is that guy standing there waiting for a bus or waiting for me to stop so he can cross?